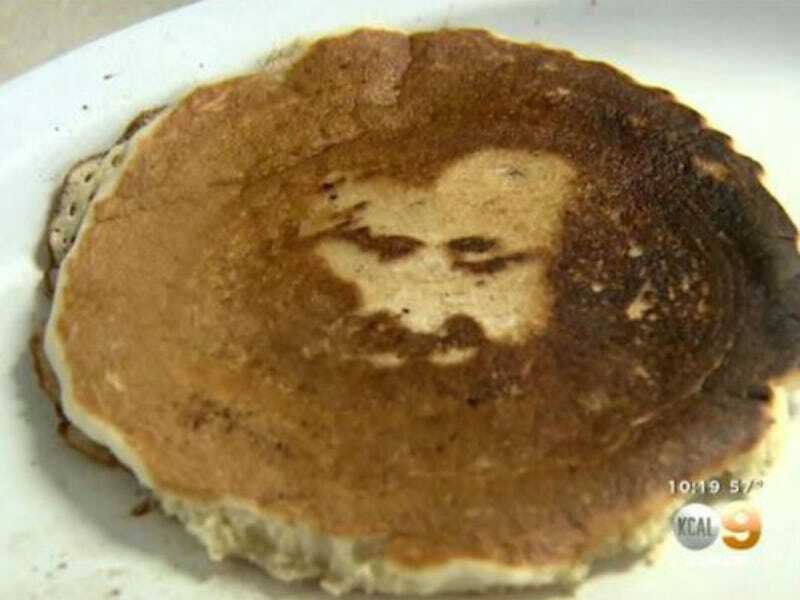 A restaurant owner in Norco, California celebrated an especially magnificent Good Friday last week when Jesus Christ showed up in a fresh stack of pancakes. Karen Hendrickson, the owner of Cowgirl Café, said a server initially noticed the biblical figure show up in the breakfast favorite on Good Friday. "He's got a mustache and a beard, and it looks like he's got a receding hairline here," she said. "Receding hairline." See, guys? Jesus doesn't need to be Photoshopped in his images. Hendrickson said the night before the pancake showed up on the grill, she asked God for something. "I said, 'Dear God, please just continue to look over the Cowgirl Café,'" she said. God said "OK, cool I was going to shower you with untold wealth so you and your hardworking employees never have to work again—but how about this vision of my son in a breakfast item instead?" Employee Edgar Ceja also sees the image of Jesus. "I did see the face. To me, it's impressive because it was on Good Friday, and I don't really see that very often," he said. He doesn't see visions of Jesus "very often." Probably just two or three times a month. While some people see Jesus, others think the face resembles other figures. "Some people can see Jesus. Some people are saying it looks like Abraham Lincoln or a hillbilly. Some people are even saying it looks like Charles Manson," Hendrickson said. In their defense, there have been a rash of hillbilly sightings in breakfast foods recently. Yesterday I thought I saw one in my Egg McMuffin meal. But it wasn't a hillbilly. It was just a hash brown. Regardless, the pancake is being saved in the freezer. "He's still on the same plate he was when he was put up on the window," Hendrickson said. "I plan on keeping Jesus on this plate and preserving him so I can share him with everybody." Luckily, they got him to safety before someone doused delicious blueberry syrup on him. That would have been a sacrilege. Only the Pope can undo the harm of blueberry syrup. Maple syrup you could maybe get away with having a local priest bless the evil out of. Maybe.